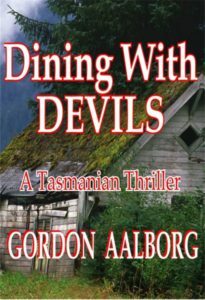 2nd in the “Specialist” series of Tasmanian thrillers. On a remote Tasmanian grazing property, a gundog judge is murdered, at first glance by a blind man shooting blanks at a dead pigeon in an incident seen but not understood by Tasmania Police Sgt. Charlie Banes and his close friend, visiting Canadian author Teague Kendall. Meanwhile, Kendall’s almost-lover Kirsten Knelsen, an ardent caving enthusiast, is kidnapped elsewhere in Tasmania, with nothing to even suggest the two incidents might be related. Then Kendall himself goes missing. It takes all of Charlie’s “country cop” skills to discover the links, which involve Kendall’s vengeful Tasmanian ex-wife, a psychotic, American-hating ex-Viet Nam sniper, and a killer believed to have been dead for more than a year! Charlie’s rush to save his friends and end the killing spree is a race against time through the eucalypt forests of Tasmania’s east-coast highlands. Aided by a cranky old bushman and his even-crankier Jack Russell terrier, Charlie also has help from the ubiquitous Tasmanian Devils … world-class scavengers with their own ideas about appropriate table manners. Earl Merkel: Author of Virgins and Martyrs and Final Epidemic. Carl Brookins, author of Bloody Halls and Devil’s Island.